Fuengirola harbour on Costa del Sol. It’s barely 7am on a Saturday morning. 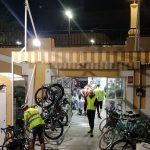 It’s the start of the Fuengirola 300 Brevet audax, organised by the Cordoba based Randonneurs del Azahar. A gang of men on Lycra and Hi Viz are milling around a bike shop. There are about 20. I’m the only one of female orientation. Everyone is on carbon bikes, with more deep section wheels on show than on a Saturday morning in Hillingdon. Local police turn up, puts the blue lights on, and we start, slowly, behind the car, all the way to Torremolinos, the first control. The organisers are there, making sure we’re all ok.
Brevet cards get stamped, and we’re off by ourselves. I make the fatal mistake of not using the facilities and sure enough, about 10km later, I’m bursting for a wee. I ride on, hoping that with the fairly high average age of the group, someone’s going to need to stop soon for the same reason, but no! So I pull over, and they all go. Hoping to catch them all , I TT for a few km, but soon give up as I don’t want to exhaust myself. So I spend the next 40-odd km riding by my little self. Which is quite nice, as the weather is good and I can stop and take as many pics as I want. 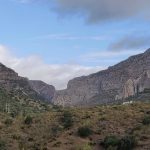 Having skirted the spectacular hilltop town of Alora with its Moorish castle, I ride past the well known Caminito del Rey, a cliffside walkway clinging onto the side of El Chorro gorge. Having walked there, it’s really cool to see it from the saddle. Shortly after another rider catches up with me, a Russian from Estepona. We ride together a bit, but he’s so grumpy and miserable, that I make an excuse of putting my rain jacket on and stop. Passing a roadside cafe, I hear loud whistles. It’s the boys I lost after my toilet stop. I don’t want to stop, so I ignore them. It’s now drizzling so I decide to not take pictures of the 3 massive spectacular reservoirs I ride past/through, and climb out of the range onto a plateau and the second checkpoint. Here in Spain you don’t gather receipts as Proof of Passage , you get your brevet card stamped anywhere that has one. I grab a quick sandwich. Another 70-odd km by myself, through olive groves, up an evil little climb which I’m sure is being put there just for the sake of it (or maybe trying to push the already considerable e elevation gain of 4500m) , as I can see a nice flat road going around it. But I decide not to risk it. Reward is that the descent on the other side gives me my only QOM on Strava. I pass through Estepa, another pretty white place with an impressive Moorish ruin on a hill, and on a narrow , straight bit of road on the other side, I see a roadside memorial. There are lots of them here, but this one is different. It has a bike wheel attached to it. About 15km later, I get to the furthest point on the route, at 143km, and the 3rd control point. It’s a one horse town, so it takes me a couple of attempts to find a bar with a stamp. Riding out of town, I stop for another photo of the angry skies, and that’s when 4 others catch me up. We end up riding chaingang , which is quite funny as my attempt to do that once in a UK Audax was a small disaster. The boys decide to stop for coffee in the next town, Osuna, but I decide to crack on. I get around the corner, and there’s more loud whistling, It’s another 4 riders from earlier. Would be a bit rude to ignore them twice, I decide, and pull over. It’s a good thing I do, as 10 minutes later, the rain and hail starts. And stops. And starts again. A while later, the barman appears with a printed train timetable. When it eases, we set off again, now a 9 strong posse. Rain comes again and and by 4th and final control we are all cold. There are 2 chaps who are completely under prepared with only shorts on , and no rain wear. Very unusual for the Spanish as they are usually covered from top to toe. There is a rough road after that, about 2km long, with gravel and potholes, and the punctures start. One is the chap with next to no clothes on. I feel so sorry for him. Luckily there’s a climb a while after so I get a bit warmer. It’s now been driving rain for about 2 hours. I later learn that the 2 chaps got hypothermic and took a cab back. On top of the climb some of the boys decide to stop for a coffee. I’m reluctant but I don’t want to ride alone in these conditions so I agree. And get very very cold. I entertain the idea of quitting. But we’re in the middle of nowhere. We leave, after the kind bar lady has given us rubber gloves to keep us a bit drier. As darkness falls, the rain eases. There are only 3 of us now, and we have to wait for Diego on climbs. We get to the highest point on the ride at 920 metres, and start descending on narrow, wet pitch black roads. Luckily there are no cars to speak of, and the corner marking chevrons are VERY handy. I think to myself, it’s a good job it’s dark, or I’d freak out just at the thought of how dangerous this long descent is! With all 3 of us having proper lights, we can actually see quite a way ahead, and after a while it even gets warm! 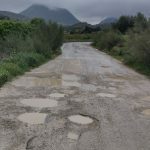 And the road is dry! We’re nearing the coast. .
Fuengirola lights come to sight at last, but it’s another 10 or so painful km to get there. Finally, the welcome sight of the harbour, just before 2am! It’s taken us 17.5h! But we’re within the 20h time limit for 300km, so all is good. Brevet cards get posted in the post box by the bikes shop door. I tell the boys they’re mad. They tell me I’m no better. 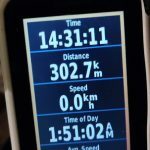 303km, 4280m of ascent. Don’t want to do that again in a hurry!